International Truck recently launched its new Class 6/7 International MV Series at the 2018 Work Truck Show. The MV Series launch completes the company's Project Horizon product refresh, and reflects that initiative's improved cab design, along with the same driver-centric enhancements already launched in Class 8 vehicles. 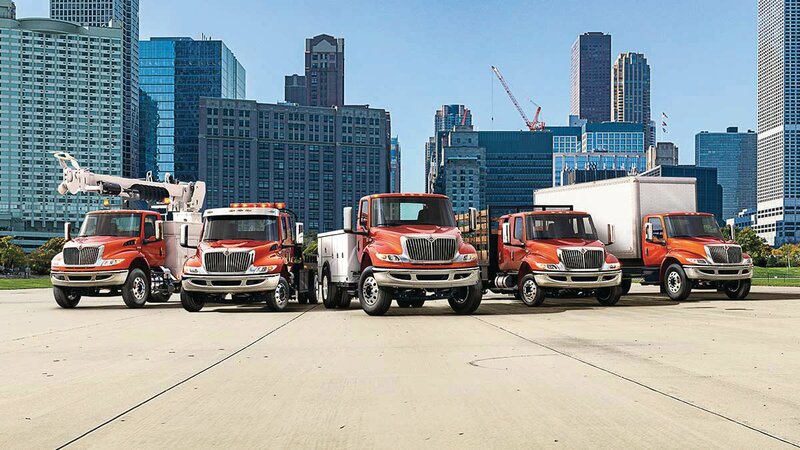 "Project Horizon was focused on delivering new levels of efficiency to customers, creating unparalleled driver satisfaction and leveraging the smartest technologies available," said Michael Cancelliere, president, Truck and Parts. "The MV Series delivers on those promises by combining uncompromising reliability with enhanced productivity for the driver, maintainer and upfitter." The MV Series was designed from the inside out with the goal of delivering a truck that is easily configurable to produce maximum output day in and day out. The redesigned features include new cab doors with a lower bottom glass edge and removed vent window, giving the driver a single large piece of glass to look through, greatly improving side visibility and reducing blind spots. By reshaping the doors and side glass, the position of the optional pedestal mirrors was optimized so drivers turn their heads less and keep their eyes on the road while reducing neck strain. Second, a new premium gauge cluster with a digital driver display was added to give drivers real-time monitoring of vehicle operation and other important alerts in clear sight. The new display also offers up to 15 customizable digital gauges. The new premium instrument panel features a customizable digital display suitable for any medium-duty application. The flat-panel dash contains space for up to 30 customizable switches ensuring functionality for any type of body that is mounted on the back. The switches offer large easy to read text and are back lit for easy viewing at night. The MV Series is also equipped with a new best-in-class HVAC system, designed for reliability, which includes a high-performance MAX defrost feature. An additional vent has been added to help keep the middle front passenger comfortable. "The new International MV Series reflects our vision for the future of commercial vehicles with a host of advancements that support improved driver safety and productivity," said Jeff Sass, senior vice president, Sales and Marketing. "We challenged ourselves to make the best even better and this new vehicle was designed to provide the best driver environment in the industry and we exceeded all of our targets." To further improve driver productivity and safety, the MV Series features the best-in-class Diamond Logic, an advanced electrical system that streamlines chassis and body equipment integration and allows customers to program automated tasks. Equipped with the Diamond Logic electrical system, the MV Series will get the job done with both safety and precision by offering customers nearly 200 factory available body integration and driver efficiency features, plus the ability to customize infinitely more vehicle functions. Like all International models, the MV Series can be managed digitally through the OnCommand Connection platform, which features the company's leading-edge Advanced Remote Diagnostics system designed to enhance fleet efficiency, as well as Over-The-Air (OTA) programming through the nine-pin OnCommand LINK device, enabling drivers or fleet managers to utilize a mobile interface to initiate authorized engine programming at the customer's facility over a safe, secure Wi-Fi Connection. OnCommand Connection telematics, including telematics hardware and monthly data packages, are also available through International Truck dealers or through OnCommandconnection.com. "As a result of customer and Truck Equipment Manufacturer feedback during the design process, we have designed the MV Series to seamlessly integrate with any body solution," Sass said. "This truck can be easily configurable for any application." The MV Series was engineered to make it easier to maintain and get back on the road fast. When service is needed, customers can count on one of more than 700 International dealers with expert technicians and an extensive parts inventory throughout North America. The MV Series is available in a variety of specifications: Regular Cab, Extended Cab, and Crew Cab. It is available with the choice of either the Cummins B6.7 or L9 engine, both of which have been engineered for reliability and durability in order to deliver lower costs of ownership with maximum uptime. The standard transmission on the MV Series is the Allison 1000 HS automatic, with Allison FuelSense 2.0, with DynActive Shifting as an available option that features a patented torque converter to provide infinitely variable shift points based on vehicle configuration operating conditions. The company is taking orders today and market availability is spring 2018. For more information visit: www.internationaltrucks.com/trucks/MV-Series.